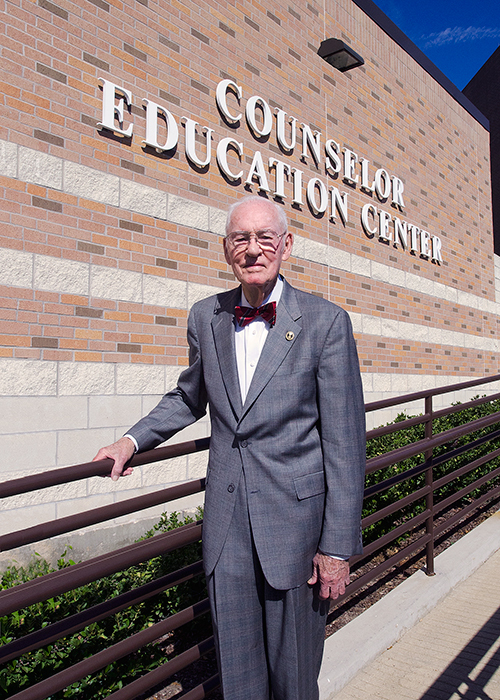 Educator, advocate, visionary...these are among the roles Professor Emeritus of Education Jack Staggs has filled through the years as a leader in counselor education. Not only has he worked to prepare future school counselors in the classroom, he has devoted countless hours behind the scenes to establish scholarships so that talented Sam Houston State University students are rewarded for their outstanding efforts. Staggs became interested in teaching while in military service during World War II at Roi-Namur Airbase. As the supply and disbursement officer at the base, he oversaw the work of approximately 200 men, and he noticed that many of them were high school dropouts. Staggs was studying chemical engineering at the University of Oklahoma when joined the Navy. Once the war was over, he returned to his native Arkansas and enrolled in Central Arkansas State University to complete a degree in mathematics and physical science with a teaching certificate. He had accepted a job in Hawaii at Schofield Barracks Dependents School when he was summoned to go to Washington, D.C., for the mothballing of the Atlantic fleet. He was approached by Captain Lyles Creighton, the head of the school board at Guantanamo Bay, to teach there. When he had completed his year-long teaching commitment, he returned to Arkansas and taught math for a while. However, he discovered that he was more interested in the development of the student than he was in mathematics. He enrolled in Vanderbilt University and earned a graduate degree in counseling, then went to the University of Houston where he received his doctoral degree. Following graduation, Staggs was offered a job in central administration in the Corpus Christi school district, but he refused because he wanted to be in the classroom. “I told the superintendent I wanted to go where the children were, so he sent me to Wynn Seale Junior High School,” he said. Around this time, the Gilmer-Aikin educational reform bill was passed by the Texas legislature, which authorized the placement of counselors in public schools. Staggs was one of nearly 50 in the state to receive approval to work as a school counselor. “There were three of us in the Corpus area who had received letters, and we began helping at the other schools in the area that didn’t have counselors,” he said. Before long, Staggs was attracting attention. Staggs agreed to help get one started, but he wanted the center to be more than just for students. He had worked in juvenile shelters and knew a need existed for young people in those types of facilities to receive counseling services. The center became fully operational, and in October 1959, Staggs was asked to speak at the Texas Personnel and Guidance Association in San Antonio. During an intermission, Elliott Bowers, who was dean of students at Sam Houston State at the time, told Staggs that he wanted him to come to Sam Houston. “I told him I was perfectly happy in Corpus,” he said. But Bowers was persistent, and Staggs soon found himself the target of a letter campaign encouraging him to take a look at the campus. In January 1960, Staggs joined the education faculty at Sam Houston State. After his first full year, he was named the director of the teacher education program. He was concerned that the college didn’t have a counseling center, but he didn’t have much administrative support for one until later. He was, however, asked to work with the dean of women and the dean of men to address student issues. Staggs also met with the fraternities and talked with them about behavior concerns. When Bowers was named president of SHSU, Staggs’s dream of a counseling center on campus became a reality. 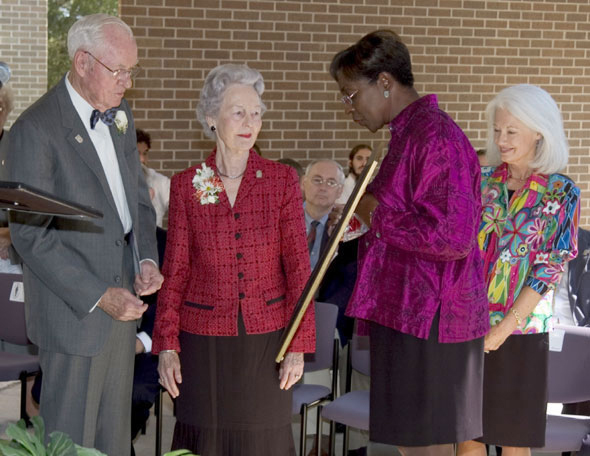 Just as Staggs had envisioned the Del Mar clinic providing a service for the community, the one at Sam Houston State was established the same way. “We made it available to area residents to bring in their children for testing, to come for marriage counseling, or whatever they needed, and we set hours that would be convenient for them, such as the late afternoons,” he said. Today, the clinic continues to be a training facility for masters and doctoral level students who are enrolled in the counseling program at Sam Houston State University, offering group counseling for all ages, family counseling, adolescent counseling, individual counseling, and couple counseling. Staggs drops by whenever he has a chance. “It’s very interesting to watch the children and how toys are used in therapy,” he said. The legacy he leaves on the counseling profession—the students whose lives have been changed by his philanthropic generosity, and the students, faculty, and community members who continue to benefit from his lifetime of servant leadership to improving education—is immeasurable. His work was not limited to the contributions he has made on their behalf of the students in counselor education, however. He has been the catalyst in the establishment of four prestigious scholarships at Sam Houston State—the Jessie A. Lewis Reading Scholarship, the Valine Hobbs Elementary Education Scholarship, the Mozelle Powell Spanish Endowed Scholarship, and a scholarship established in his name by Kappa Delta Pi. “I first met Jessie Lewis in Corpus Christi when I was at Wynn Seale Junior High. We were receiving a number of students—too many—who were reading at about third grade level,” he said. Later, when Staggs came to Sam Houston State to teach, he recommended that Lewis come to teach reading. Before her death, Staggs worked with Lewis and her attorney to help with her estate planning. Staggs assisted Valine Hobbs with estate planning, as well. “Valine taught children’s literature at Sam Houston, and she was a lover of cats,” he said. “The students called her class ‘Kitty Lit.’ When they’d come for registration, they’d say, ‘I want to register for ‘Kitty Lit,’ and everyone knew which class they wanted,” he said. Staggs had also worked with Mozelle Powell in Corpus Christi and was instrumental in having her recruited to teach Spanish at Sam Houston State. The SHSU Chapter of Kappa Delta Pi Education Honor Society established a scholarship in Staggs’s name to honor the contributions he made to the organization as its sponsor. Through the years, he has personally supported the scholarship. He also established the Jack Staggs Educational Leadership Dissertation Award and the Jack Staggs Counseling Dissertation Award. He funded state-of-the art audio-visual equipment for the counseling doctoral program. Former counseling professor Carol Parker presents Staggs and wife Kathleen with framed photos to commemorate the dedication of the Jack S. Staggs Counseling Clinic in September 2004. With Parker, on the right, is former College of Education dean Genevieve Brown. Not all of his time as an educator was spent in the classroom. He served as president of the Huntsville Rotary Club and governor of Rotary District 5910. He worked extensively for Rotary International, which presented him with its “Service Above Self Award” in 1998, the first awarded to a Rotarian in the district. He stepped down from his position as head of teacher education when he became district governor, because of the tremendous amount of travel that he would be required to do. When Staggs returned from his position with Rotary, he was given teaching assignments and served as the advisor for the graduate program in the College of Education. He retired, but continued teaching two graduate classes in counseling for seven more years. “Then I said, ‘No more.’ I had been doing that for 50 years, and there was just no point in staying on,” he said. In 1993 the Texas State University System designated Staggs as Professor Emeritus of Education. In addition to creating the campus Counseling Education Center at SHSU, he had helped strengthen the teacher education program and enhanced its reputation. Because of his numerous contributions to the counseling program both at SHSU and in Texas, in 2004 Staggs was honored as the namesake of the Dr. Jack S. Staggs Counseling Clinic in the Counseling Education Center. The tradition goes back to his days as an undergraduate at Central Arkansas. Some of his former students got into the act by a designing a large bow tie sculpture that he keeps in his garage.